This picture shows a 1917 version. Originally produced in 1914, this tractor became very popular. So popular, that the General Motors Corporation bought out Samson - apparently in an effort to match the success of Henry Ford's Fordson tractor. Do you have any comments or questions about this tractor? Ever use one? Know anyone who owned one? If so, please join in on the discussion below. Use the form for entering your comments. I have a sampson tractor located in a field in oklahoma, wheels are good tank is there but rusted some parts missing. Is any one interested. I have inherited a Samson Sievegrip single cylinder tractor, it was restored in 1995 and runs now as well as it did when new. I would like to make contact with any interested folks about this tractor. Does anyone know how to free up a seized engine. I have a John Deere AR. Re Neville Thompsons tractor I am pleased to see the Sampson is still in the family. I remember it well. Your Grandfather Horace and your Father Ian were clients of mine in the Nuffield BMC days.This is one tractor that is in good hands. Have you still got Grandads MG 1100 . Hello I am interested in making contact with any person or persons who may be able to assist me in determining the market value of a Samson Sievegrip tractor that my clients have recently taken ownership of. Any help would be appreciated, drop me a line if youlike. Thanks Roy H.
I have a Samson 3 wheeler in my shop. It is complete but the engine has been frozen up for 30-40 years. Head is off and cylinder walls are deeply pitted. Would like to know if anyone out there would like to purchase it restore it. Tractor ser# is 2116. Model is S25. Engine number is 7338. Has GMC emblem on tag on engine. Don t know what year it is. I am looking for a Samson M tractor. My great-great-grandfather bought a Samson M brand new back in 1922 and it was our first tractor on the farm. I live in Everett, Pennsylvania, and it would bring great joy to my family if i could find one before my great-grandfather is gone. The tractor had wide front end and fender wells on it! IF anyone has any information on this subject please e-mail me!! Thank you very much. There is a 1917 - 1919 MC Samson Sieve Grip sales Booklet/Brochure for sale on ebay, its original and very nice...if interested its there. My brother and I joint own a Sampson Seivegrip, 1916. It was fully restored 20 years ago and runs like clockwork. We show it at various farm shows in North Canterbury, NZ. This tractor is the other one mentioned by Dave, above. My brother and I joint own a Sampson Seivegrip, 1916. It was fully restored 20 years ago and runs like clockwork. We show it at various farm shows in North Canterbury, NZ. 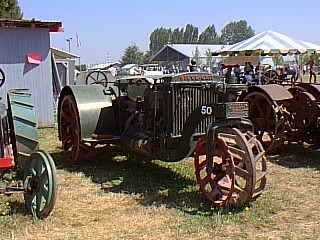 Saw two of these at the "100yrs of tractors in New Zealand" show, March 2004 at Kirwee near Christchurch. Have just obtained a video film of this event. If anyone knows of a Samson Sieve-Grip with anything remaining of the Flying GMC Logo fender decal, please let me know. Samson started in Stockton, CA, later bought by GMC. Did not last long after that. I HAVE A 1917 SAMSON CIVE GRIP TRACTOR WHICH MY DAD PURCHASED NEW AND FARMED WITH FOR MANY YEARS. I HAVE RESTORED IT. I AM MISSING THE STARTIN CRANK. IF ANYONE KNOWS WHERE I CAN GET ONE I WOULD LIKE TO HEAR FROM THEM. My last name is Samson. I just learned about this Tractor (Samson Iron Hourse). I was wondering were I could find out about the history of the Samson company. Hi, My uncle has a Samson tractor which he has restored to running condition. I was going to find him some more information on the net. However, his does not have the tricycle front end. Am I on the right trail. I remember that he said something like "...they quit making these and started making Chevys..." so I think it's the same outfit.?? I am in the Thornbury Vintage Tractor club, we have a Samson tractor, it is painted grey you will find that you will probably have trouble with the clutch as that it wont functoin right. If it does could you contact me. i have a friend who has one of the last remaining samsons but it was in bad shape when he got it so we doubt if it will ever run again. A 1 cylinder Samson Sieve-grip 612 has been found in England. If anyone knows any thing about this type of tractor information would be welcome. Check out the book "Orphan Tractors" by Bill Vosler for article on the Samson. Can email debbenga at rconnect.com to maybe order a copy. They may be out of print. one of the best sampsons that i have ever seen was at pioner acres in irricana alberta. It was in show room sape but it was a tragedy that the man that started the restoration and did most of the work did not live to see it finished. His parterns and friends finished the job as a tribute to him.